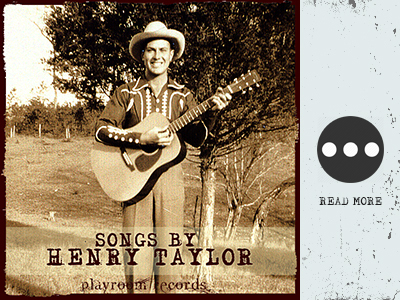 "Songs by Henry Taylor -- A collection of country/western songs written by Henry Taylor and performed over a period of 70 years by Taylor and his grandson -- dating all the way back to the 1930's!. A few years have passed since he bought his first guitar for $3.75 from Sears. He was 17 years old then. That was back in 1932. Now he owns a collection of fine guitars you can't find in any catalogue. All were handcrafted by Taylor himself. A friend's influence helped peak Taylor's interest in music, and ultimately was the reason he made his first guitar. The first was built using a kit, but after that one, all instruments he created were entirely TAYLORMADE. Most of his guitars have been acoustic, but a few have been electric, and there was even one mandolin. The mandolin was a prototype and given to one of Taylor's many grandchildren. The mandolin was destroyed by one grandson when he was too young to know how to treat a musical instrument. Taylor restored the mandolin and the same instrument was used on the Songs By Henry Taylor album, coincidentally, by the same grandson who destroyed it over 20 years earlier. Taylor notes that he didn't read music when he first started playing the guitar. ""I don't remember just how it all started, but I really first began playing when I was in the Navy. I had previously learned shaped notes (do re me) while at church 'singing school' during the summers."" Born in Hartselle, Alabama, Taylor started playing with a group called the Lone Star Bucharoos that aired on a local radio station in the 1930's. ""But that was so long ago,"" says Taylor. Then there was Hank Taylor and the Southern Playboys. A band that played local gigs around Alabama. Taylor retired (from his day job) on his 61st birthday, January 23, 1981. He had worked as an aircraft mechanic for 27 years at Hays Aircraft International in Birmingham, Alabama. Since then, Taylor has had more time to spend working on his instruments in his own little music shop behind his home, nestled on a quiet, wooded side road in Hanceville, Alabama. Taylor married his sweetheart, Laverne Bailey, on October 14, 1945. They have 7 children, 21 grandchildren and over 25 great grandchildren. Taylor's love for music didn't stop with him. He has passed his musical interests and talents on to many members of his family. Some have even made music their profession."